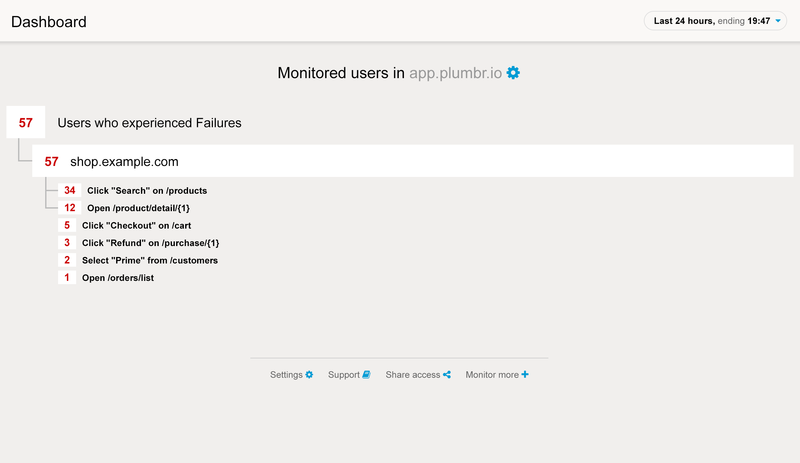 Plumbr – User Experience & Application Performance Monitoring | Want to know how well your software works for all end users? Plumbr Real User Monitoring will capture the digital user experience. 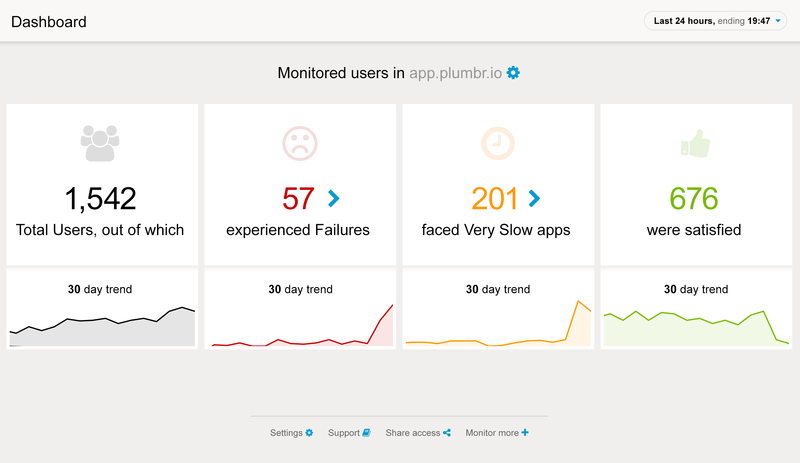 Plumbr Application Monitoring will build distributed traces to spot bottlenecks & errors. Plumbr Professional Services helps your team to gain control over performance & availability. We will not overwhelm you with data or metrics. Instead we expose evidence-based intelligent insights that equip your team with the knowledge of how, when and why to use this information to improve the digital user experience. Plumbr Browser Agent captures every interaction with the UI along with the duration and outcome of the interaction. API calls to back-end are linked with the interaction. Our Browser Agent keeps track of what the users are doing and what they are experiencing. As a result, you get exposure to entire user journey. Our backend agents trace the API calls to back-end throughout the distributed infrastructure. Errors and bottlenecks experienced by users are captured and linked with the user interaction. Our agents trace every user interaction throughout the nodes processing the interaction. As a result, end-to-end transparency is gained. Whenever any of the back-end services fails to respond successfully, the corresponding error is captured and linked to the failing user interaction. All performance issues are captured in back-end nodes as bottlenecks referring to the problematic source code and linked to the failing user interaction. Taking control of performance and availability can be a daunting exercise. We will be there to support your team with our experience and best practices. We make sure installation instructions will be tailored for your build/release processes & technologies. We help you to integrate the information exposed by Plumbr to your existing tools and processes. We will help your teams to start using the information exposed by Plumbr. Be it incident or problem management, support workflows or SLA management – we will tailor a solution best suitable for you. Monitoring solutions alone will not make your software faster or more reliable. They need to be deployed as part of a continuous feedback loop embedded into your change or incident process. Our products capture and expose the information about the user experience. This insight enables you to make the decisions of whether, what and how to improve. We need to understand how you develop and maintain your software. We have carefully investigated the different development and operational practices to tailor different solutions based on what is best fit for you. Your engineering and operations team will be equipped with objective evidence on all performance and availability related issues. Your team will no longer make decisions on what to investigate or fix based on rumors. Better yet, we zoom you right into the source code causing the issues. Every failure in the back-end is traced to its origin in source code. All failed interactions get mapped to specific errors, exposing a list of unique errors ranked by their impact. Every user interaction exposes the bottlenecks where the most time is spent. All interactions including this bottleneck are mapped to the specific bottleneck, exposing a list of bottlenecks, ranked by the total time each of them added to user interactions. Your team should not rely on end users reporting the issues. Before the support receives a complaint, your engineering team is already resolving the incident. Send a PagerDuty alert when during the last 10 minutes the rate of users facing the errors has exceeded 2%. Median response time for real users has increased over 800ms. 99th percentile for response times has increased over 5,000ms. If you improve the performance by 20%, the engagement over content would raise 6%. We will help you to understand the impact performance and availability have to any business objectives – be it engagement, retention, conversion or productivity, you will know what you will lose due to errors and bottlenecks. ROI calculations on performance or availability improvements become possible. We are aware that your team is already using different monitoring solutions and processes. Plumbr provides API to integrate the information captured by us to tools and methods already in place. Using a central solution for metrics and alerts? 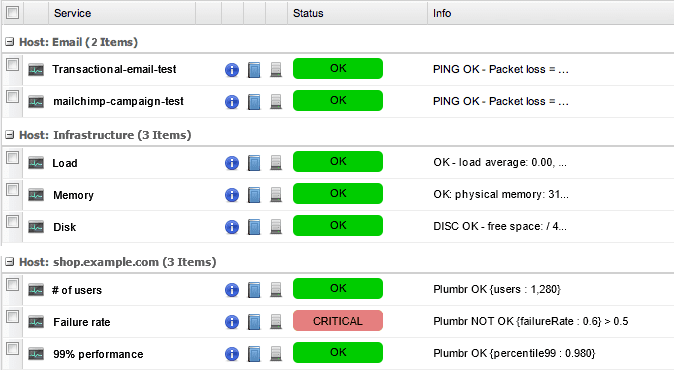 Integrate performance and availability metrics captured by Plumbr with your Prometheus / Zabbix / Nagios via our API. Making business decisions based on BI dashboards? Enrich the information on your DataDog / Tableau dashboard by correlating the business metrics with performance and availability information captured by Plumbr. Having a streamlined incident management process in place? Enable your operations team to make decisions based on objective & evidence based information captured by Plumbr. We take pride in what we do. To the extent where we do not measure our success in dollars but in the amount of time we save for your end users or how many failures we helped you to avoid. Everyone in Plumbr from marketing to sales to engineering to customer success is focused in making sure you will gain control over the performance and availability. We have made sure our goals are aligned with your gains. 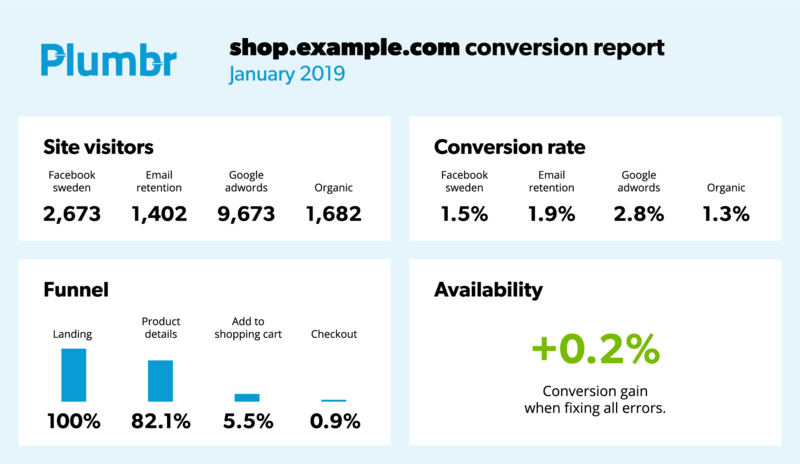 We stay true to our mission and track our progress by keeping an eye on whether or not your users are enjoying faster and more reliable digital user experience. We want you to succeed. If you are interested in joining the Plumbr community, start by using our products on a 14 day trial or contact us for a demo.